This The Man with the Iron Fists review has to give filmmaker RZA some props for a wildly striving effort for a first film. The Wu-Tang Clan member not only wrote and directed the love letter to Asian cinema’s classic Kung Fu movies, but he also stars. What does speak to RZA’s talent is that he has a co-star in Oscar winner Russell Crowe. He completely loses himself in the insanity of his character, a driven opulent opium war leftover in nineteenth century China. Crowe is the best part of the film. RZA is a blacksmith, who landed in China by chance and has made a life for himself in a small village town that is being threatened by a violent gang. He, on one hand, does well for himself financially making weapons for these thugs and simultaneously those who seek to dethrone their dominance. Yet, he wants a better life for himself and his lady of the night girlfriend Lady Silk (Jamie Chung) and doesn't want violence to be the means to an end. The Man with the Iron Fists has the familiar familial betrayal, predictable forbidden love, but it does have a great variety of martial arts fight scenes and a quite creative collective of imaginative weapons. 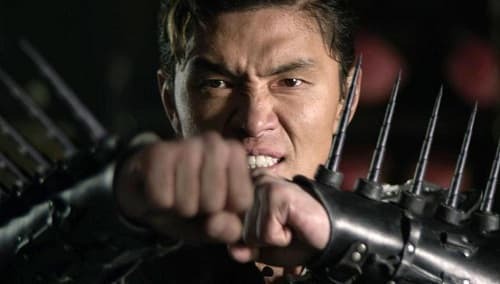 Byron Mann is Silver Lion and with his Bon Jovi 1980’s hair he doesn’t seem like quite the menace, but we have to say, he does make a damn good antagonist to RZA’s protagonist. What Crowe is we’re not sure… but that is exactly the point. His reason for even being in that town is not revealed until the final moments of the film. Although The Man with the Iron Fists is not a Quentin Tarantino Kill Bill type of film that is likely to cross over, there is a fan base that will turn out for what has proved to be rare, the Hollywood martial arts film. The fact it is produced by Tarantino and Hostel’s Eli Roth could bring in some interest. But this is all about fans of martial arts movies, particularly the ones who would spend countless Saturdays watching hours of the good, bad and ugly of Kung Fu cinema. For everyone else, the film can be seen as a great example of the work of a first time filmmaker who should have a promising career. As he gains experience and hones his message and themes -- and perhaps steps away from the acting to focus on the filmmaking -- we could well see several RZA movies becoming a blockbuster one day.